Dinnertime decision-making has never been this easy! 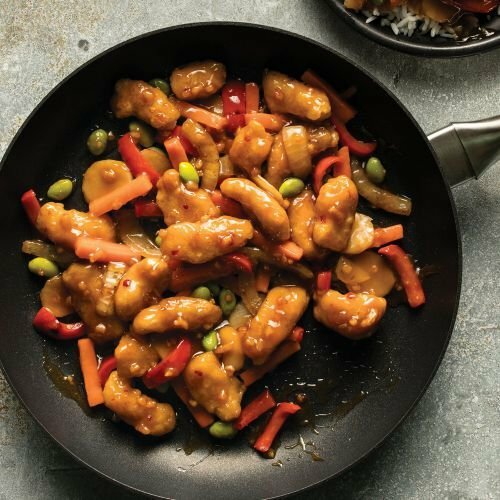 With our Dinner, Solved 4 Meals Plan, you get 4 specially curated Omaha Steaks meals - all at once, all for one low price (you'll save an EXTRA 15%). Keep these meals on hand and at the ready to enjoy an easy gourmet meal any night of the month. It's the perfect aid to help you schedule your weekly menus! Best of all, these meal plans are subscription-FREE. Simply check back next month to order an ALL NEW selection of Omaha Steaks meals. INGREDIENTS: THAI JASMINE RICE, TEMPURA CHICKEN (CHICKEN BREAST MEAT, WATER, WHEAT FLOUR, CORN STARCH, POTATO STARCH, CONTAINS 2% OR LESS OF CREAM OF TARTAR, EGG WHITE POWDER, GARLIC POWDER, RICE FLOUR, SALT, SODIUM BICARBONATE, WHEAT STARCH. COOKED IN VEGETABLE OIL), CARROTS, WATER CHESTNUTS, SUGAR, WATER, EDAMAME, ORANGE JUICE CONCENTRATE, FIRE ROASTED ONIONS, RED PEPPERS, SOY SAUCE (WATER, WHEAT, SOYBEANS, SALT), RICE VINEGAR, CORN STARCH, CHICKEN BROTH FLAVOR BASE (CHICKEN BROTH, NATURAL FLAVOR), GINGER, GARLIC PUREE, ORANGE, TOMATO PASTE, SPICES, SALT.